Guerlain La Petite Robe Noire Eau de Parfum, 1.6 oz. 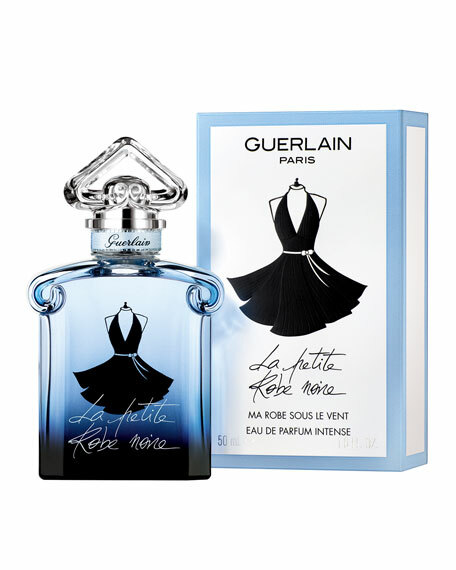 GuerlainLa Petite Robe Noire Eau de Parfum, 1.6 oz. In La Petite Robe Noire's fragrance wardrobe, I'm the Stylish Dress. The glass of the legendary "upside-down heart" bottle has been tinted a magnetic and incredibly chic midnight blue. In silhouette, the new dress design is revealedit leaves the shoulders bare and seems ready to take flight at the slightest movement! I'm absolutely indispensable and totally irresistible. I am Guerlain's chic and terribly glamorous fragrance creation. I'm La Petite Robe Noire. I am the chic and very seductive perfumed creation by Guerlain. Gourmand Floral. Gourmand, Unforgettable, Surprising. A brand new melody, in which the candyfloss accord is enhanced by vanilla and Bulgarian rose essence from the Guerlinade. A dash of bergamot paired with a blueberry note, reveals all of the fragrance's energy. They are accompanied by soft white musk and a woody sandalwood-patchouli accord with a stunning sillage that makes the scent unforgettable. For in-store inquiries, use sku #1954813.